Today we visited a local Italian pizzeria located in the trendy “Grunerlokka” area surrounded by bars, cafes and restaurants. Mangiamo Restaurant is a local Italian pizzeria in Oslo, with an interesting menu based on salads, pizzas, antipasti and pasta. It is not the first time we visit this place. We have eaten at Mangiamo many times. I am fond of their Italian style pizza. Over the course of my dining experience I have always gotten a consistently good pizza. They may have different cooks but the pizza has maintained the same excellent quality every time. The location could not be better. 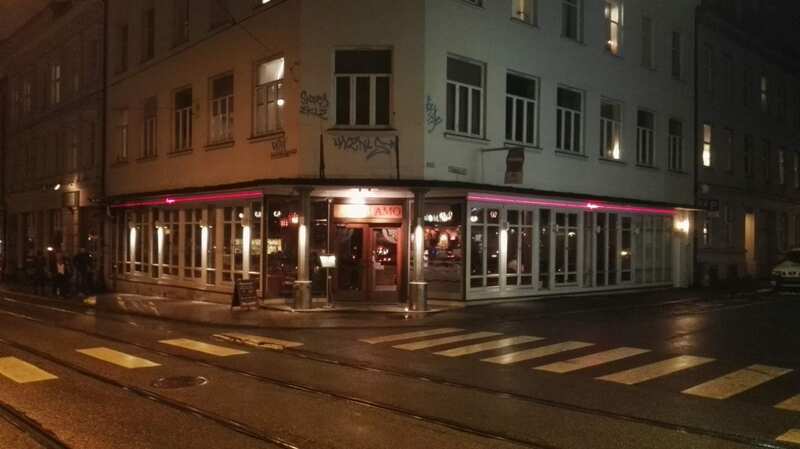 It is located in the main street of Oslo trendiest restaurant strip, Grunerlokka, with lots of nightlife. The direction is Thorvald Meyers gate 43 gate, Oslo. You cant avoid to find it when you walk along the main street. Grunerlokka is for the moment our favorite suburbs of Oslo, Norway. Their pizza Pieta di Mangiamo is their classical one and probably the best-selling pizza. The pizza comes with mushrooms, parmesan cheese, ruccola salad og parma ham. 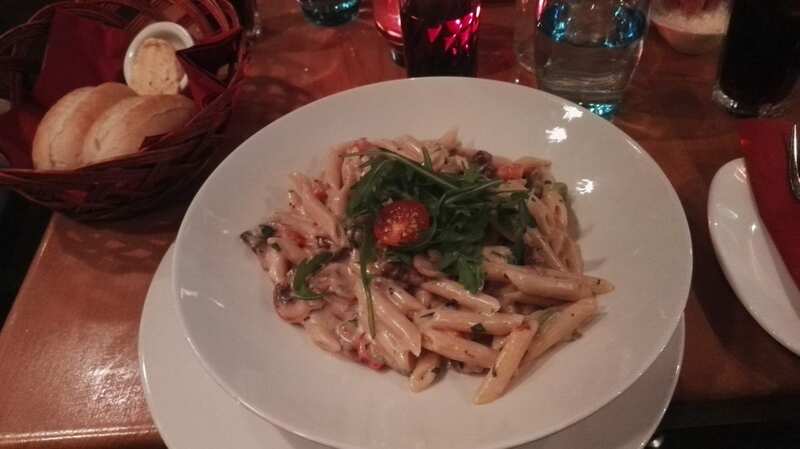 The pasta Penne Piemontese is sold in Small Portion (fairly priced 99NOK = 11 EUR)) and Large (164NOK) It is served with shredded meat fillet, mushrooms, onions, garlic, pepperoncini, parsley, fresh tomatoes and port, and it also comes with cream sauce. The taste of was delicious, and we really loved the mushrooms! The restaurant has a good looking ambient, the waitresses are friendly and you get exactly what you expect out of a local Italian pizzeria. I would probably rank it some interesting dots. The prices are average for Norway, One pizza costs approximately 160 NOK (15 EUR) and a coke costs 39 NOK. (3.8 Euros). We had a good time at Mangiamo Restaurant and will definitely come back. A dinner for 2 was fairly priced, 401 NOK, 45 Euros, acceptable for eating out in Norway. 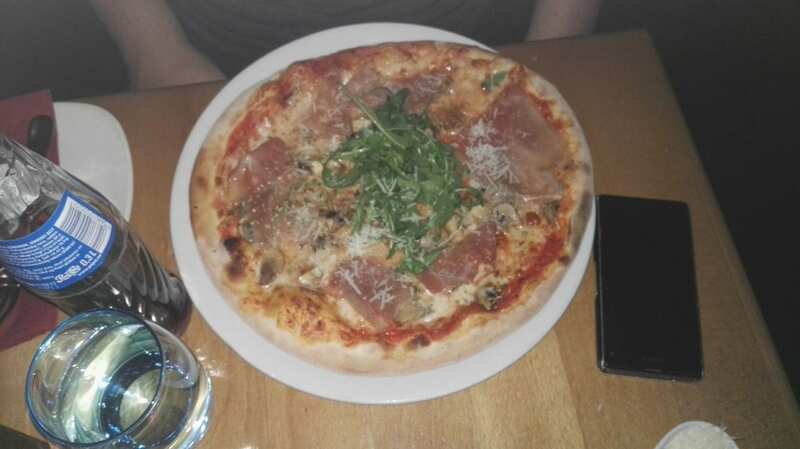 We would definitely recommend Mangiamo Pizzeria in Oslo to our Distrita readers. You will probably not find it stunning, overwhelming or anything else than a just a good pizzeria with authentic Italian food you can rely on!